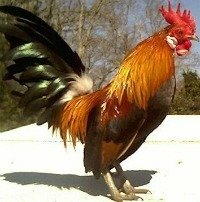 The Dutch Bantam chicken breed is a fine specimen for a Bantam and gives a good supply of small eggs. It is now a favored bird for fanciers and exhibitionists. Size: Male: 21 oz. Female: 20 oz. Comb, Wattles & Earlobes: They have a small, bright red single comb with five well-defined, upright points. They have broad red wattles and medium-size, oval, pure white earlobes. Color: The beak is bluish horn, unless otherwise noted, and the eyes are reddish bay. The shanks and toes are slaty blue, unless otherwise noted. Black: The eyes are brown and they have standard black plumage. Blue: The eyes are reddish brown and they have standard blue plumage. Blue Light Brown: Male: The head and back are brilliant reddish orange and the hackle and saddle are golden red with a flash of gold at the ends and a dull blue stripe down the middle. The front of the neck is blue tinged with salmon with darker blue lacing. The breast, body, and legs are slaty blue with a darker blue lacing or tinge. The tail is slaty blue and the wings are slaty blue laced in darker blue or bay, with lustrous orange highlights. Female: The head is orange to golden yellow, tinged with brown and the hackle is orange to golden yellow with a dull blue stripe down the middle. The back, body, and wings are golden brown stippled in blue. The breast is salmon shading to gray in the legs and the tail is slaty blue. Cuckoo: The shanks and toes are slaty white and they have standard cuckoo plumage. Golden: They have standard golden plumage. Light Brown: The beak is light horn to white and they have standard light brown plumage. Self Blue: The eyes are reddish brown and they have standard self blue plumage. Silver: They have standard silver plumage. Wheaten: They have standard wheaten plumage. White: They have standard white plumage. Special Qualities: A good bird that lays lots of small eggs. This breed was developed in Holland in the 1600's. This breeds ancestors were picked up by Dutch seamen who took birds from the East Indies to supply meat and eggs during their journeys. These earliest predecessors are thought to have been some of the earliest domesticated chickens, being domesticated from the jungle fowl in Indonesia. These birds came to be popular in early Holland because of some of the rules for servants. Peasants were allowed to keep eggs from their hens, but only if they were small. Large eggs had to be given over to the lord of the manor. So of course, considering that these Bantams were good layers of small eggs, they became very popular and the peasants bred them to continue to develop these eggs. This breed is a true bantam with no standard breed. It is the smallest bantam that is recognized by the APA and the ABA. The bird was first brought to North America after WWII. It didn't really become popular and all but died out. There was another importation in 1969 and 1970, with several subsequent importations, and today it is quite popular with fanciers. These birds have an upright carriage and an attractive long tail. They are normally gentle and friendly, though you will come across the mean rooster from time to time. They are susceptible to cold and require good shelter in the winter months. They are also good fliers for their size. They are good layers, but not in the winter months. The hens are known to be good mothers and will go broody. They were first recognized by the APA 1992.